I'm having fun banging out designs for ADAM doo-dads - maybe some of them will actually work! Comments in another thread got me thinking; what about RAM expansion? ...I've been trying to reverse engineer the board in the piccies. 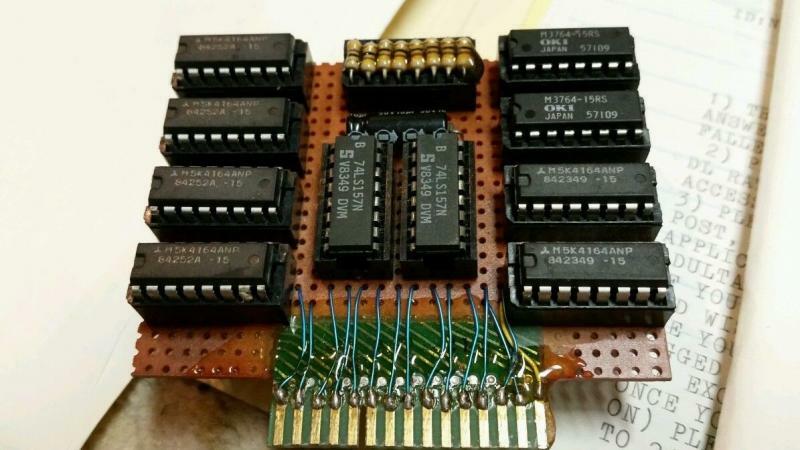 Sorry I can't remember what thread I found it on but it appealed to me as the design seems to potentially support stupid amounts of RAM - about 2mb? But a conjunction of 'missing' info and running out of brain has left me a bit stuck. *obviously for an 8 bit system to be able to address so much RAM the ADAM must have a fairly advanced paging scheme. Here's the Micro Innovations schematics. I like to share my designs wherever possible in the hope they might be of use to others. As I'm now very likely to roll my own version of the schematics pearsoe has kindly posted does anyone currently own this design? -If still a commercially available product I might need to keep any potential version of my own to myself. I've been trying to reverse engineer the board in the piccies. Sorry I can't remember what thread I found it on but it appealed to me as the design seems to potentially support stupid amounts of RAM - about 2mb? But a conjunction of 'missing' info and running out of brain has left me a bit stuck. 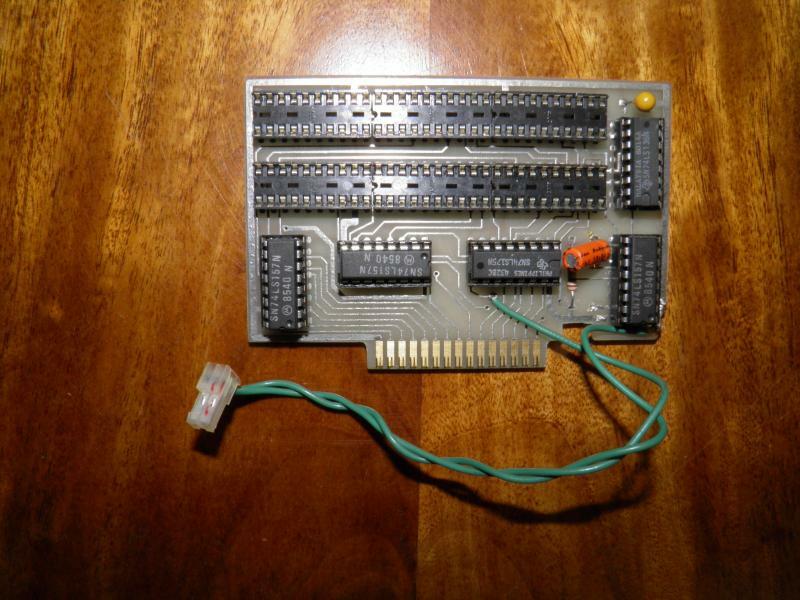 The Memory Expander pictured was made for and distributed thru E&T Software (Ed Jenkins). It uses 256K SIPP Memory Modules and can be upgraded in increments of 256K all the way up to 1Mb. 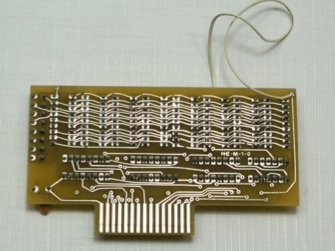 I tested out quite a number of these that we sold thru NIAD, but they were always on a 256K populated board. I don't have much else to offer on this M.E. Attached are full schematics, silk screen, etc., etc. for the Micro innovations lineup of Memory Expander. Attached are pics of other Memory Expanders made for the ADAM... all install in Slot #3. Hopefully the Micro Innovations tech files will provide the necessary info you need for the memory addressing. Thank you yet again. Much appreciated, I shall enjoy looking through those documents and trying to make sense of them. Oh, and I really like those bread-board versions - very ghetto, my kind of work... at least before PCB fabrication became to cheap and easy. 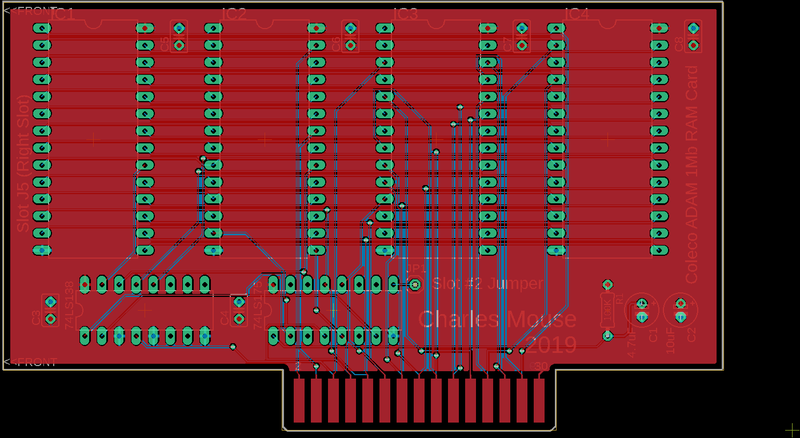 Hopefully there will also be some confirmation as to which pin(s) are required from the middle slot to be able to shoot for more RAM... glad I've not sent off the gerberbers for my attempt at a serial / 80col board yet - hopefully I'll be able to add a header for a RAM board. And following on I'm too cheap to by a proper GAL programmer so it's ghetto-time which is just a pain. In short I think I'll have a go at a spin on that 1mb design. Hmm, still no confirmation on what middle slot pin is used by larger RAM boards... I think I'll need to have another look at some MI middle slot designs to get an idea. Edited by CharlesMouse, Sat Mar 30, 2019 10:36 AM. It seems to require two entire boards. You can't just attach to a pin. You have to decode the bus signals to find out when it's specifically talking to you about setting the memory page. 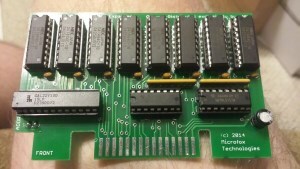 According to the instructions, it piggybacks off of another board such as the printer interface. 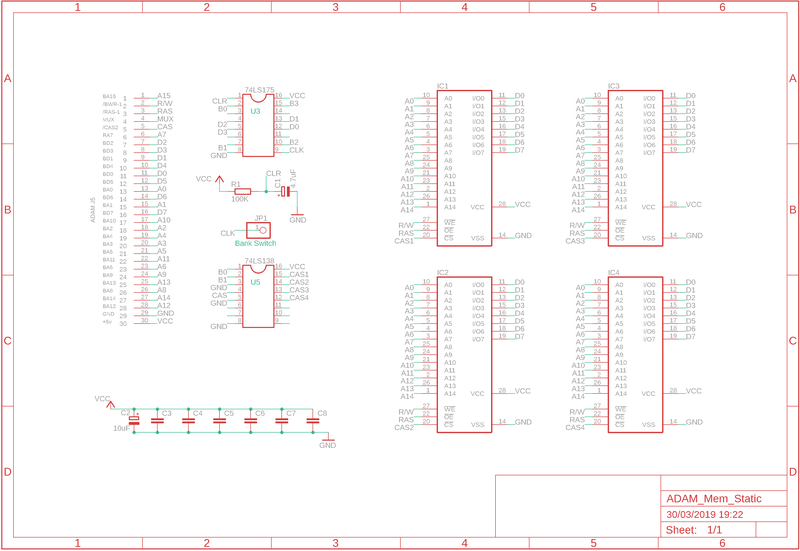 Also, the schematic seems to be a newer version of the board than what is pictured. Your picture has 4 74ls157s and one 74ls175. 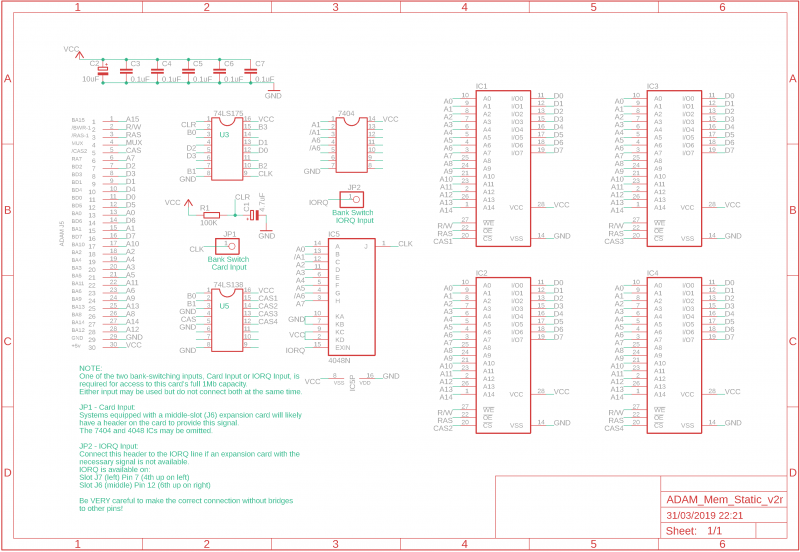 The schematic has 3 programmable logic chips. You may well be right there... but I'm hoping I'll only need an extra addressing signal off the middle slot (J6). Having taken a good look at some of the higher capacity RAM boards, and the 4Mb E&T board in particular, they all seem to use very similar address decoding. Indeed, now I've seen the prototype MI board schematic (using 74 series logic) it's basically the same set-up as the E&T board. ...having said that, could I be wrong? Absolutely. Do I know bog-all about the ADAM's architecture? Oh-yes. FWIW: My odd way of familiarising myself with a system that's new to me is to (sympathetically) hack it. ...to my uneducated eye '175 and '138 look to be for address decoding and RAM selection while the '157s were needed to translate the ADAMs addressing to work with the SIPPs and so not needed to drive the static RAM chips I'm using. Why 4x 256k instead of 1x1mb..? Pure laziness on my part. It was easier to delete the ICs that the four RAM chips hopefully didn't need but leave the rest of the logic in place. Also as a small aside I have a bit of an aversion to plugging stuff in to old machines that dosen't quite look the part... modern boards tend to look too spartan when attached to old machines. Um, if anyone is kind enough to do a quick sanity check on what I've done, and indeed the assumptions I've made, I'd really appreciate it. Edited by CharlesMouse, Sat Mar 30, 2019 2:39 PM. MSTB is the strobe signal used for bank selection with higher capacity cards. -How best to whip-up a bit of port decoding with some 74 series logic - hmm, more IC's I fear. While I'm now sadly in to the realm of actually applying some effort to this plan I'd still appreciate a sanity check on the above board, thanks. Edited by CharlesMouse, Sat Mar 30, 2019 3:26 PM. 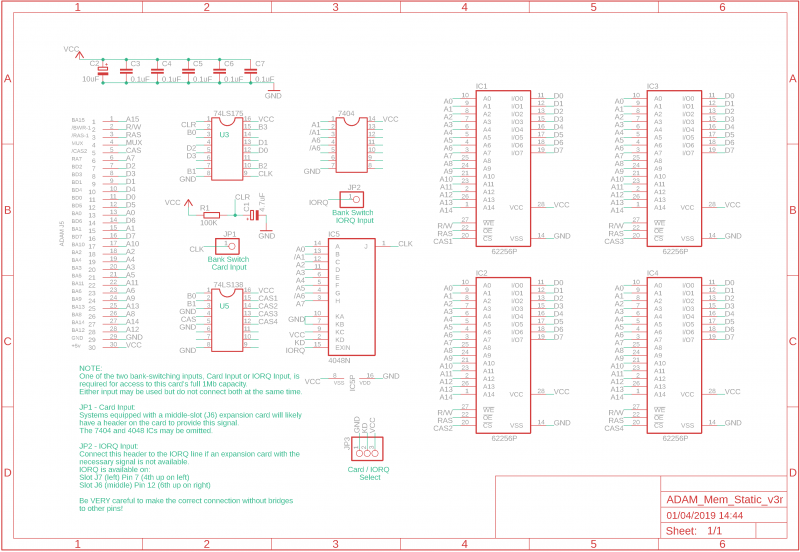 It looks like you plan to use 32Kx8 SRAM chips to bank switch between? RAS, R/W set accordingly, then CAS. RAS will be held low (active) for the entire period. With SRAM, you of course need the entire address on the address bus. 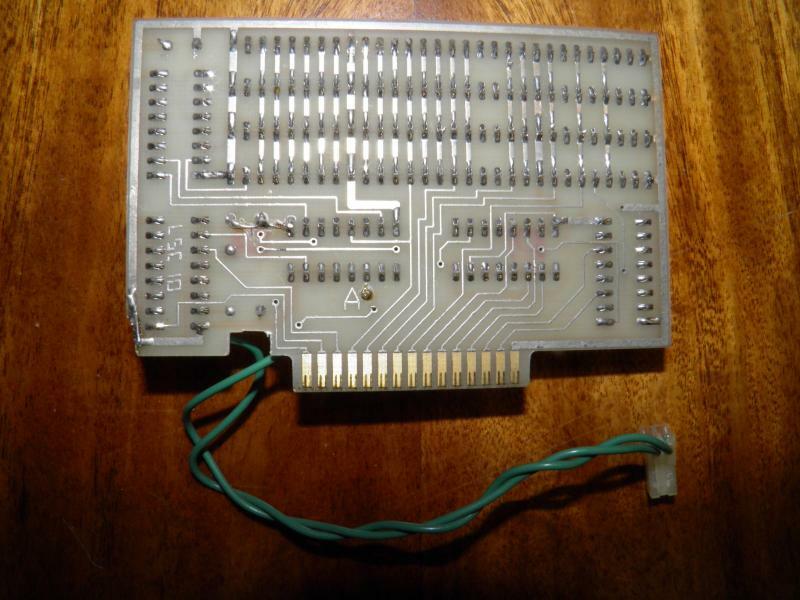 Looking at a AS6C62256 data sheet, it does appear that the signaling will be compatible with the way you wired the chips. On a memory read, you will see RAS, then R/W (low), then CAS. The truth table on the data sheet says that when CS and WE are active, it doesn't care about OE, so on CAS this shouldn't cause the chip to seize control of the data lines (yay). For reads, CS (RAS) comes first, WE (R/W) stays inactive, and OE (CAS) will signal data output. So as long as you use a chip where OE is ignored on WE, this should work. For future reference, I see that the memory slot gets a line called RA7 rather than BA7. I am guessing that this has to do with memory refresh. The Z80's refresh counter never changes the 7th bit, so it cannot refresh the entire 64K address space by itself. Don't ask me why the engineers designed it that way, but that's just the state of things. So they have a value from the MIOC (a custom IC that interfaces between the Z80 and the 6800's that litter the machine) that maintains a phantom 7th bit for refreshes. The PLA maps that external flip-flop into bit 7 whenever RFSH is active. When not on RFSH, this output matches BA7. This becomes RA7. (Maybe it stands for "Refresh Address 7"). Now, for technical information on how expansion RAM is even accessed, I found an Adam emulator and peeked at its code. xxxx xxNN  : Lower address space code. xxxx NNxx  : Upper address space code. 11 = Cartridge ROM (ColecoVision mode). The upper nibble seems to be ignored entirely. And as is already apparent, bank switching is done by writing a value to port 0x42. Of course in the case of your 32K banks, the upper bank will just be a mirror of the lower bank. The value of port 0x42 itself represents which 64K you want to see within the memory space. It is always organized such that the first 32K of each bank maps to the lower 32K and the second 32K always maps to the upper 32K. You can't map the second 32K into the lower 32K, or the first 32K into the upper 32K. So this lets you bank up to 16M into this system. Yikes. As to how to decode 0x42 without an I/O card, the simplest solution does seem to be a hex inverter and a 4048 in OR mode. Put bits 6 and 1 on the inverter. 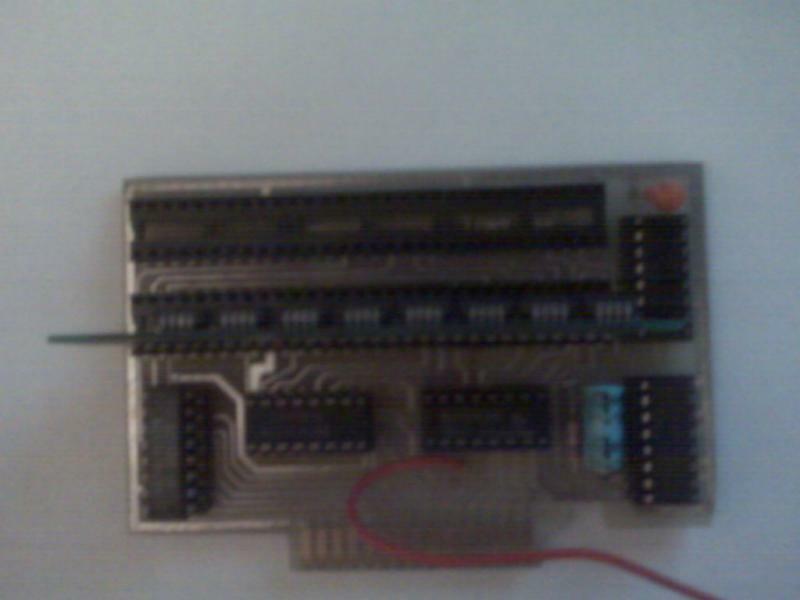 Then along with the other bits, into the 4048 inputs. IORQ goes to the EXPAND input. Edited by ChildOfCv, Sun Mar 31, 2019 3:30 AM. ...in a nut-shell as long as everyone uses a different port and everyone has fully decoded said ports all is good. On the other hand you can skimp on ICs which generally results in decoding blocks of ports which can result on overlaps if everyone is doing that. No worries on the information front. I really, really appreciate your taking the time to post so much very helpful information - I suspect you've given me a real leg-up on this project, especially as I'm going to have to put some thought in to it now. 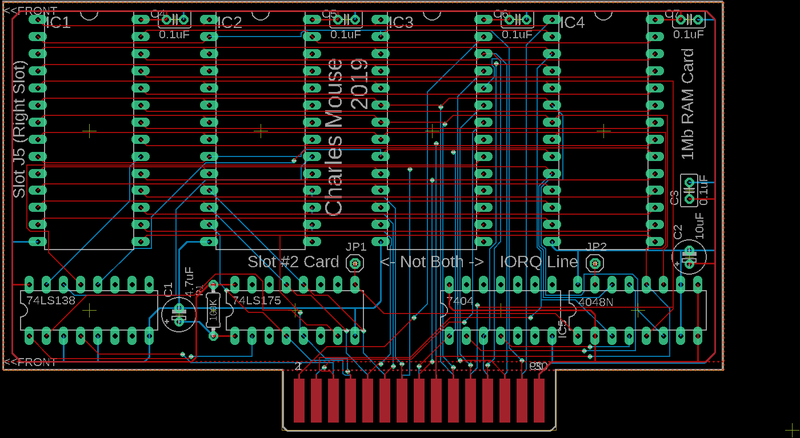 I could have gone with a single 1Mb SRAM but I'm trying to minimise mistakes & effort. Hex inverter and a 74048..? Edited by CharlesMouse, Sun Mar 31, 2019 10:48 AM. Once again my sincere thanks for the most generous help. Here's another go with addition of the relevant logic. ...or getting my MSB's and LSB's mixed up on A0-A7, I'm 'good' at that! ...and for those without there's a second point for a flying to attach to IORQ. Not exactly convenient! I'll break out the old multimeter in a bit and see if there's a suitable passive that can be attached to. Edited by CharlesMouse, Sun Mar 31, 2019 4:14 PM. Why not just take every conceivable peripheral possible and cram it onto one card? We can do that, now. I mean literally just... SRAM + Raspberry Pi interface, done. The ADAM makes that impossible. The memory expansion port is the only one that gets the RAS signal. The other two ports are the only ones that get the IORQ signal. That's why all paged memory solutions are 2-card solutions. With SRAM, you could get away with this since you don't care about RAS in that case. But for DRAM, it has to be in the third slot. Not just because you need RAS, but because you want the 7th refresh address bit too. Edited by ChildOfCv, Mon Apr 1, 2019 1:02 AM. One note: If you hook up the clock directly, the 4048 should have output disabled. So Kd should be selectable with a jumper. If 1, there is IORQ decoding. If 0, it is high impedance. Thank you again, yes I should do that. I can be a bit slap-dash. Nearly there... Believing the ADAM to be a rather flaky beast I did have a decoupling cap for every IC but deleted all but the RAM-caps this time as I was getting short of routing space on the footprint I made for myself. Here's hoping I don't end up regretting that. 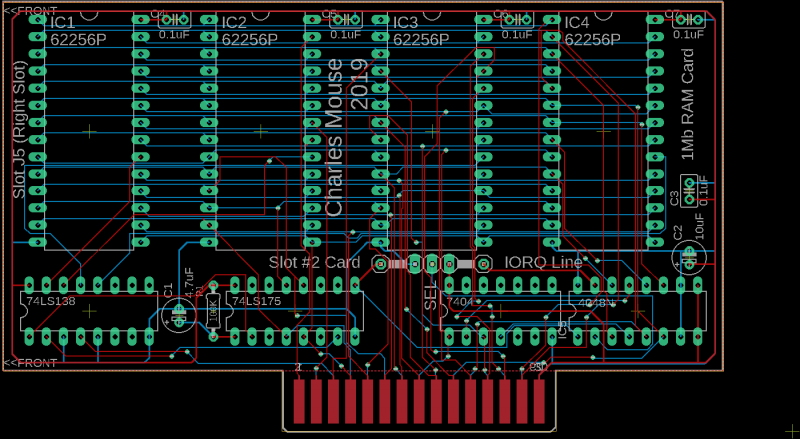 Out of sheer masochism I use Eagle for board design. I did an ADAM.lbr file for the three expansion slots - not pretty but functional. I've attached it in case it's of use to anyone else. Edited by CharlesMouse, Mon Apr 1, 2019 5:17 AM. ...it looks like I'm going to be keeping Seeed busy with orders. As usual I think it important to point out I barely know what I'm doing. Files are provided in case anyone else finds them useful but don't try to make your own until I've hopefully reported back that it works. Edited by CharlesMouse, Mon Apr 1, 2019 8:06 AM. One potential improvement once the initial prototype is finished, is to use a single 256Kx8 SRAM chip instead of the 4 32Kx8's. Not only does that give you twice as much memory at a reasonable cost (like $3 per chip, and in PDIP package) as well as fully 64K mappable space, but it also lets you use the lower 2 bits of your bank select register as the upper 2 address bits on the SRAM. 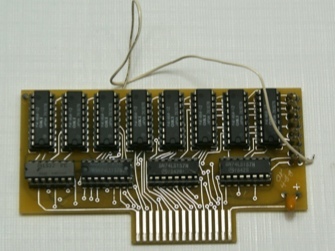 You could still keep the 138 for multiple chips, based on the upper bits of the page register. This would give you up to 1MB of SRAM capability. The chips would likely have to be laid horizontally just like their controlling logic, though. Edited by ChildOfCv, Mon Apr 1, 2019 1:27 PM. It would be neat to own a 2MB or even a 128MB memory expander for the ADAM. A 64GB SDXC card is more faster then the ADAM computer and maybe there is a way to make a ADAM memory expander that uses a 64GB SDXC cards. Its nice to see someone working on making a home made memory expander for the ADAM. 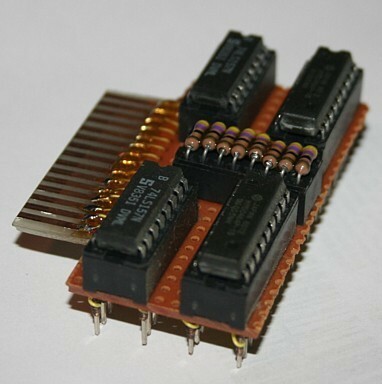 If a 2MB or larger memory expander every went into production for the ADAM computer I would be interested in buying the memory expander. Edited by HDTV1080P, Tue Apr 2, 2019 1:39 PM.